The Pet Advocate's Town Hall was created in honor of Mikey with hope that others will not have to suffer the way he (and we) did while we went from vet to vet frantically searching for answers about his mysterious health problems. We had never heard of anyone or anything having an adverse reaction to vaccine until it happened to Mikey. Then we quickly realized it is not as "extremely rare" as many vets want us to believe. 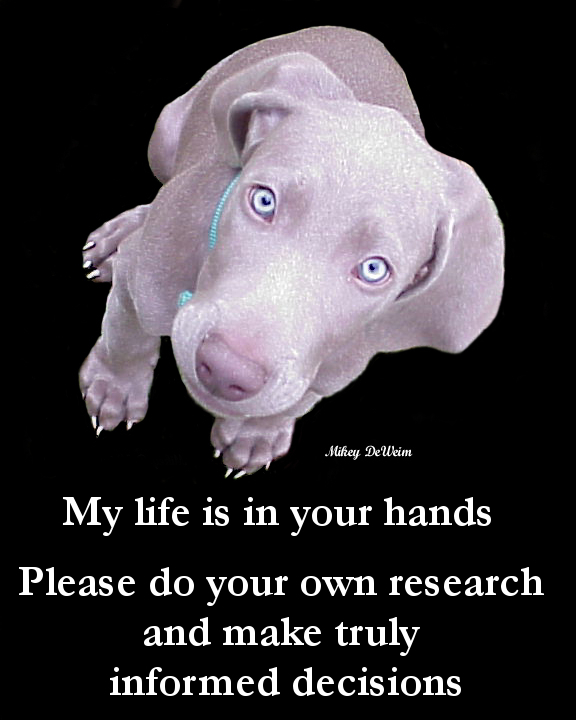 That belief was reinforced when we got another Weimaraner and he had the same problems but Louie's symptoms appeared much sooner and more severely than what we experienced with Mikey. It is our sincere hope that our boy's horrible ordeal will help you avoid what could be a fatal tragedy. 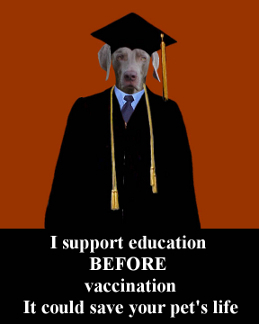 Many vets are not aware of the symptoms and are clueless about how to treat vaccinosis. 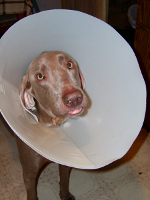 Lab tests are often "normal" and "allergies" is a very popular diagnosis, one that could actually be a fatal mistake. Both of our boys survived. PLEASE read this article. It is a gold mine of information. When I started researching Mikey's mysterious illness I was fortunate enough to find this article by Ann Martin. I think it is one of the most helpful sources of information I have ever found. It is well written, easy to understand and it is loaded with information that I found to be quite shocking but has been consistantly confirmed by but many vets and some of the world's leading experts. I had to search for confirmation because I could not believe it, our vet never told us any of this! "It is mandatory for the patient's immune system to function properly." "It is mandatory for the patient's immune system to function properly in order to respond appropriately to a vaccine challenge. If the immune system is immature, it cannot do so. If the patient has a disease that suppresses the immune system, it will not respond. If the patient has fever, the immune system will be so "occupied" with the fever that it will respond poorly to vaccine." 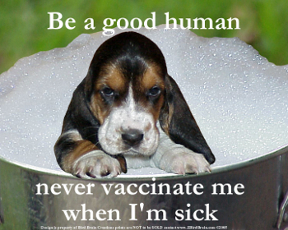 "Fever has been shown to inhibit the response of the immune system to canine distemper vaccination in puppies. Certain viral infections may also decrease the ability of the immune system to adequately respond to a vaccination. 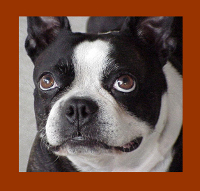 Even stress, such as boarding could decrease a dog's response to a vaccination." 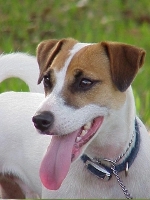 " You might have noticed that rabies vaccines are labeled for either one year or three years. The answer is that there is no difference. It is the exact same vaccine." they can be passive and allow their vet to decide whether and how often their pets are vaccinated, or they can research vaccine safety and efficacy themselves and start taking a more active role." This article is extremely informative. 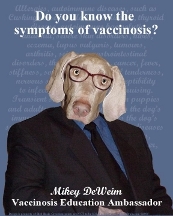 If your pet is sick this one is a "must read" especially if your pet has some kind of "mystery illness." 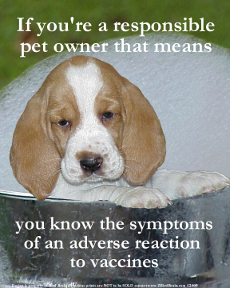 "Side effects from canine and feline vaccinations can occur anywhere from instantly up to several weeks or months later. Vaccines can even cause susceptibility to chronic diseases later in life. 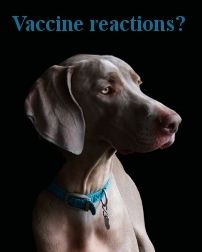 Mild reactions associated with canine or feline vaccines include:"
"Severe and fatal adverse events include:..."
"Although all dogs are susceptible to vaccine-related side effects, breeds at highest-risk of vaccinosis (in alphabetical order) are:..."
Do We Know How Safe Your Dog's Vaccines Are? "Why routine puppy shots shouldn't be routine"
Typical recommendations are not always what is best. As It Stands: Getting your pet a rabies shot? "Like most pet owners, I really didn't think much about getting my 8-year-old pug's rabies booster shot last month. It didn't occur to me she could die from it. I don't think I ever read a story about a dog dying from a rabies shot. That is, until now." 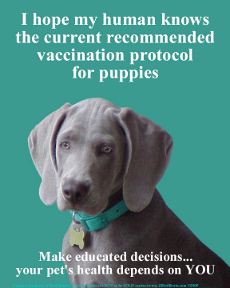 "Vaccination is an important medical decision to be made by you in consultation with your veterinarian." 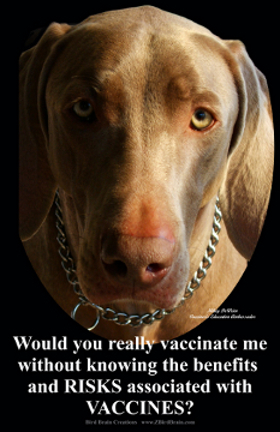 "Most pet owners aren't aware of the dangers in animal vaccinations that have been discovered in recent years. 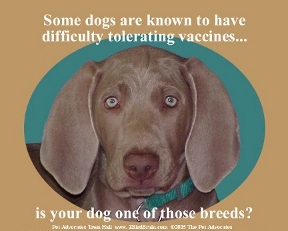 The major veterinary associations now agree that vaccinations can trigger all sorts of maladies, from allergies to cancer - but most pet caretakers (and many veterinarians, it seems) haven't gotten the word." 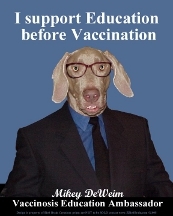 "Vaccinations represent a major stress to the immune system. They can not only cause side-effects and allergic reactions, they also contribute significantly to long term chronic disease. Chronic health problems frequently appear following vaccination including skin allergies, arthritis, leukemia, upper respiratory infections, irritable bowel syndromes, neurological conditions including aggressive behavior and epilepsy, auto-immune diseases and cancer." "small breed dogs receiving multiple vaccines per office visit were at greatest risk of a vaccine reaction"
"Zsazsa, Angela Moran’s much-loved Chihuahua, developed an injection-site tumor after rabies vaccination." 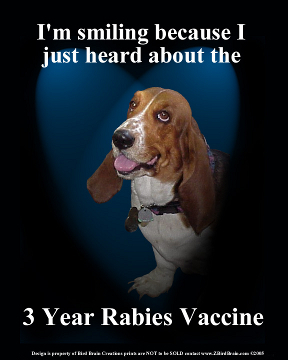 Dangerous Over-vaccination Of Dogs Is Alive And Well In The U.S.
"The Veterinary Associations Don’t Want Vets To Vaccinate Every Year"
Study indicates that the rabies vaccine actually caused four cases of rabies. 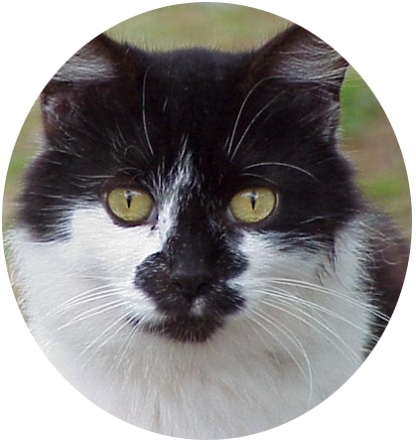 "ERA-strain modified live-virus rabies vaccine approved for use in cats." "In each case, viral isolates were shown to be of an ERA strain rather than natural ("street") rabies."